Congrats to the entire track team for a wonderful season. At the state meet, the 7th graders took home 3rd place in the State! The 7th grade 4 x 100 meter relay placed first and set a school record, Leighton Meeker took second in the 200 meter. 4th in in the 400 meter, Brett Meidel placed 8th in the high jump, and the 4 x 400 relay took fourth place. The 8th grade team did great as well. 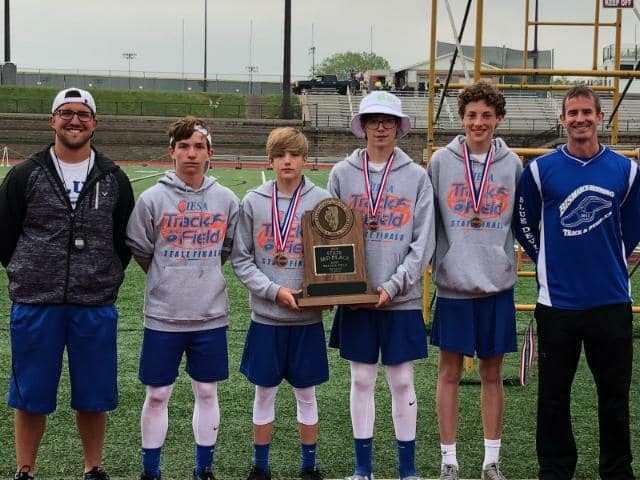 Rhett Harper placed fourth in the 100 meter and 200 meter, and Eli Mojonnier placed seventh in the 1600 meter, and the 4 x 400 meter relay had a season best time.